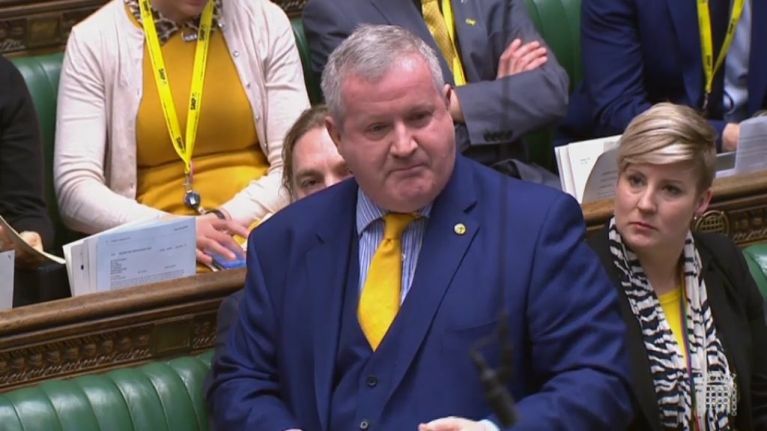 Tories were left absolutely fuming in the Commons today, after SNP Westminster leader Ian Blackford called Theresa May a "liar." MPs are not allowed to accuse each other of lying in the Commons. Blackford shouted "that's not true" at the prime minister as she said the government had published an economic analysis of its Brexit plan. May had also pleaded for her colleagues to hold their nerve and further delay the parliamentary schedule. Most believe this is simply a tactic to bounce MPs into voting for her Brexit deal at the eleventh hour, faced with the looming prospect/horror of a no deal departure. The Tory backbenches went nuts at Blackford's outburst and speaker of the House John Bercow demanded he withdraw the remark. Blackford said he would do so "in courtesy" to the speaker but not as an apology to the prime minister. Fairly expert level trolling, even by the standards of the Commons. Earlier, Blackford told the Commons Theresa May was living in a "parallel universe." He said: "We’ve just heard from the prime minister that she wanted this concluded in December. Talk about rewriting history. "It was the prime minister that denied us the right to have the meaningful vote and to try and rewrite history, and she sits there laughing, sometimes you should be honest with yourself, never mind being honest with the people of the United Kingdom."